Luke leans forward in his seat, hands clasped. Six-foot-four with midnight black skin, a rare seriousness replaces the huge smile normally found on his face. The year was 1996 when he and his father, brother, wife, and two kids were forced to flee. While the world was readying themselves for the Olympic games, in Atlanta, they were walking through the desert, with thousands of other displaced Sudanese. Luke was 24 years old, and instead of settling into life, he was starting over. Every dream he ever had for his family and career was abandoned back at his village. “UNHCR would nail a list to a tree, every month or so. A list of everyone [cleared to] go to America, Australia, and other countries.”It would be three years before Luke and his family’s names appeared on that list. A mixture of relief and fear riddled their conversations. They survived the treacherous African desert, but could they survive starting over in the United States? That was when Luke’s wife suggested he pursue skills training so he could work his way into a better job. “I didn’t think about going to school [in the first few years after arriving], because I had a family and my concern was I just needed to go to work to provide for them,” he explains. But now, Luke took the advice of his wife and tried a different approach to bettering his career: pursuing an entirely different one. He started classes at a local technical college with the goal of becoming an HVAC technician. With no prior experience in HVAC, he simply decided he would learn it. Up until this point Luke had been a farmer (in Sudan), a janitor, and a warehouse worker for a popular retail store. But now, the desire to improve his family’s circumstances was greater than any fear about leaving comfortable for the unknown. At the recommendation of a friend, he signed up for even more classes— at Tekton Career Training. 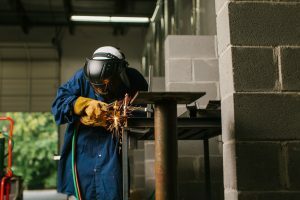 He was now learning not only HVAC, but welding and pipefitting too, certain that the three would open up a world of opportunity, and greater adaptability, within the workplace. Every weekday he drove to the technical school, and every weeknight he trained at Tekton. Even on weekends “off” he and a classmate most often met with their teacher for extra help. The support of his wife, and encouragement from his teacher kept him going. The weeks turned quickly into months. Finally, two years after he began, Luke was finally ready to re-enter the workplace, armed with an entirely new skill set. It wasn’t long before he landed a job with a heating and air company, in a starting role of “runner.” Even after two years of extensive training, his job was simply to deliver parts to technicians on site. But Luke made the most of the opportunity to learn from other technicians. For a year, he observed their work and asked questions to gain a better grasp on technique. Next, he moved up to technician assistant. In all of his waiting, Luke did not despair. He kept learning and growing, and making the most of every opportunity. Finally, after years of pursuing every ounce of information he could lay hold of, he earned the position of technician. He drives his own company truck, and makes more than triple his former, hourly employee salary— plus benefits. Even now, he is not satisfied to simply show up and do the work. Now he is the one helping other soon-to-be technicians. For every trait of the refugee workforce we’ve identified thus far, we’ve carefully supported our claims with research and data. However, we believe there is one final trait we see so often exhibited in the refugee spirit, that we would be remiss to not share. It isn’t backed by scientific research, but rather countless examples we’ve encountered over the past five years of individuals who possess an insatiable appetite to learn and do more, and who readily take on added responsibility and leadership. The trait is best defined as a growth mindset. From our front row seat, it is an acutely common trait among the refugee workforce, and a quality every company desires, but few actually expect. By the time they are resettled, refugees have often suffered years, even decades, of hardship building within them an enormous amount of inner strength and perseverance. More than simply enduring life’s punches, they have learned to get back up in the face of adversity, time and again. It’s easy to see how beneficial this trait can be within the context of the workplace. While other workers are more likely to quit in the face of failure or hardship, refugee employees aren’t easily deterred. In a healthy work culture culture, they hardly seem bothered by challenges and setbacks. They simply keep doing what they’ve always done— getting back up. The refugee workforce is great at adaptation because they know what it’s like to have their “normal” taken away, and be left with no other choice but to adapt. A new country. A new culture. A new career. They must quickly adjust to a new normal, knowing that it could and most likely will change again, in a heartbeat. The result? They learn to stay on their toes. Adaptable employees are a huge asset in the workplace. They are flexible to change, when they know it’s good for the long-run. They approach their responsibilities with plans that are held loosely, knowing those plans may need to adapt to succeed. They have an innate understanding that change is necessary to survive. By the time refugees are resettled, they are more than ready to show the world what they can do. I should note, at this point, there is a significant difference between the desire to prove oneself, and the desire to impress. Refugees are not interested in making it appear as though they have knowledge and skill they don’t actually possess. They are solely interested in working hard to prove they are capable of learning and accomplishing anything they set their mind to. This growth mindset attribute benefits companies in a big way: motivation. The refugee workforce is not motivated simply to show up and make enough money to get by— they are motivated to bring their best to the table every single day. Along with their “whatever it takes” grit lies an incredibly high tolerance to the uncertainty associated with risk. Refugees, as a whole, seem better suited to withstand the anxiety associated with change. Maybe it’s because, after years of uncertainty, they’ve learned to be content not knowing all of the answers for tomorrow, while still making the most of today. Employees who are risk-takers are more creative, and go on to achieve more than their timid counterparts. It seems companies don’t have to work hard to motivate these individuals to innovate, as their minds are already constantly analyzing data and dreaming of new and more efficient ways to do business. Unlike the individual-focused societies in much of the Western world, most refugees come from collective cultures where community is key to strength and survival. Individuals who see life through this paradigm are more “we-focused,” instead of “me-focused,” which certainly makes for not only stronger communities, but better businesses as well. Growth mindset employees care not only about their own well-being, but the health and success of the entire company. For businesses who hire and invest in these individuals, the buck won’t stop there. These individuals possess a strong sense of responsibility, and joy, in sharing their newfound knowledge with anyone who may benefit. And their commitment to invest in others makes them phenomenal leaders at every stage along their career journey. Resilience, adaptability, desire to prove oneself, a willingness to take risks, and an eagerness to help others are a handful of the distinct growth mindset that we’ve noted among the refugee workforce. Companies that learn to nourish these attributes will reap the invaluable benefits of higher innovation, higher productivity, and lower turnover. We’ll cover that in a future article, but for now, we urge you to consider how the refugee workforce and their irrefutable growth mindset can help take your company to the next level. To learn more about why refugees make great employees, visit the “About Refugees” page on our website. Refugee Workforce releases Fall 2019. Visit www.refugeeworkforce.com to sign up for updates.